Up until about 3:29 pm on Sunday afternoon, every basketball fan in America had penciled the Golden State Warriors into the NBA Finals. I mean, why not? They rattled off another 67-win season, had just swept two straight playoff series and looked more than ready to dispatch the aging and debilitated San Antonio Spurs. That, my friends, is why they play the games. I’ll be the first to admit I was among those who assumed the Warriors were a shoo-in to face Cleveland (another assumption?) for all the marbles. But odds makers listed the Spurs as seven-to-one underdogs! That means nobody, not even Las Vegas, gave San Anton a remote shot of advancing. Keep in mind this is a Spurs team that beat Golden State two out of three times this season. Keep in mind this is a Spurs team with a legitimate MVP candidate in Kawhi Leonard. Keep in mind this is a Spurs team that has made it to the Western Conference Finals ten out of the last twenty years. And keep in mind the Spurs are led by the best coach in the modern game, one of the best coaches ever. Meanwhile the Warriors are coached by that man’s understudies, one of whom is laid up with back pain so bad, he can’t even walk the sidelines. These two teams present stark contrasts in style. The Warriors force their opponents into mistakes then feed off them, often embarrassing them in the process. The Spurs don’t make many mistakes. Something would have to give. For nearly three quarters, something did give. It looked like whoever set that seven-to-one line would soon be looking for work. At one point, the Spurs were up by 25. They would be no easy out. 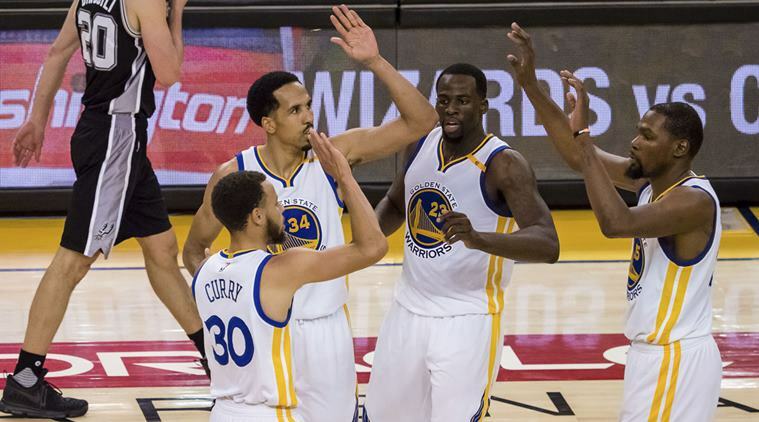 The Warriors just had five days off; they are a team built on flow and pace. The Spurs are disciplined and talented enough to challenge that pace. And they have size. If San Antonio was going to win this series, it would be in the paint. The Spurs have nine guys on their roster that are 6’9” or taller. That has been the Warriors’ Achilles heel since this team was assembled. Draymond Green is a fine, under-sized player but guarding both Pau Gasol (7’0”) and LaMarcus Aldridge (7’0”) would present a challenge. The Spurs also play pesky, physical defense, which the Warriors don’t like. While the Warriors force you into bad shots, the Spurs are equally as adept at getting you to make bad decisions, even this seemingly unbeatable and slick Warriors team. For a while, it looked like San Antonio had the recipe, the golden ticket to beating Golden State. The Warriors looked flat, beatable, listless. San Antonio looked efficient, which is their modus operandi. They jumped out to a commanding half time lead. But then came the third quarter. Kawhi Leonard turned his ankle, Steph Curry got hot and the Warriors rattled off eighteen consecutive points in just over three minutes, reminding us all why they were such heavy favorites. Odds makers breathed a sigh of relief. These are the Golden State Warriors and no lead is safe. Upsets be damned! Sprained ankle or no sprained ankle, Gregg Popovich probably felt his team should have been able to hold a twenty-point cushion against Golden State without Kawhi Leonard on the floor. For once, Gregg Popovich was wrong. Golden State won by two. The good news, ladies and gentlemen, is that we have a series on our hands. Barring any bad news from Kawhi Leonard’s foot doctor, this stands to be far less of a blowout than anticipated. That being said, the glass half full Spurs fan realizes they had Golden State right where they wanted them in Game One. Unfortunately, the glass half empty Spurs fan realizes the exact same thing. This entry was posted in Featured, Hardwood and tagged Draymond Green, Golden State Warriors, Gregg Popovich, Kawhi Leonard, NBA, NBA Playoffs, San Antonio Spurs, Stephen Curry by Chris Humpherys. Bookmark the permalink. 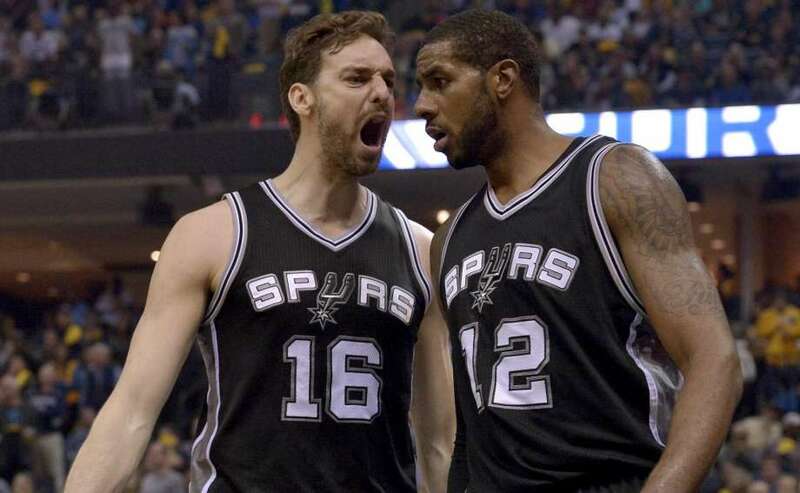 The San Antonio Spurs will continue to play the Golden State Warriors hard in this series . Unfortunately , the Spurs have been hit a real blow with the loss of Kawhi Leonard and then you have to bear in mind they have already lost Tony Parker to an injury in a prior series. For almost three quarters the San Antonio Spurs had the game within their grasp and it all changed , as Leonard went down with the recurrence of his right ankle injury. If San Antonio can pull off a game-two victory then the series could become very interesting. 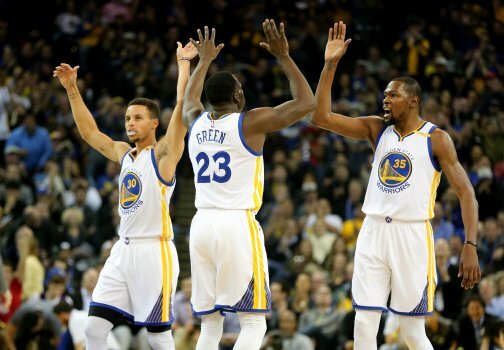 During the regular season , the Golden State Warriors lost their season match-up series 2-1 . While I understand what takes place in the regular season doesn’t have a real bearing as to what might happen in the Playoffs , I do feel it provides us with some food for thought. Now let’s see how the rest of this series pans out. So Antonio Cromartie has fathered his fourteenth child , apparently his fourth since (sixth child with his wife) his widely reported vasectomy ? What the hell happened with that particular surgery ? Joey Zaza might have just won the MVP award for his “slide under”. Whether intentional or not, it won them this game and likely, the series. The NBA needs to address this issue and punish those who do it. I don’t necessarily think it was malicious on Zaza’s part, but it took out Kawhi nonetheless. …Then again, it might have been acting Warriors head coach Mr. Potato Head’s Cobra Kai sinsei Sweep-the-leg Johnny moment. We’ll never know. All we do know is that Golden State won a game they should have lost and the Spurs and fans like me are now deprived of seeing what might have been an epic upset and feel robbed. It looks like Pop is going to rest Kawhi for Game Two. That gives him just shy of a week’s rest to heal that ankle. That also tells me he’s conceding that game. The line is already 14. It may jump up. A 2-0 deficit is not unsurmountable… unless their best player doesn’t come back from that injury. Get him a body bag, Bleed? Perhaps the Warriors should invite Billy Zabka to attend Game Two first row. For the record, it does my heart good that the original Karate Kid gets a solid 7.2 on IMDB. Does my heart good that I still have faith in the movie goers of America. I love the Spurs but I don’t see them with a chance with Parker & Leonard out / hobbled. Unless they sweep the leg on Green and Curry (or Durant). Not wishing that – just saying. I thought before the series began the Spurs would get a game but didn’t think they’d ever be able to make it a series. And then the first half happened. Shame Leonard went down and so did San Antonio. Obviously if he can’t go the Spurs will be going fishing sooner than later. I concur I don’t think how Kawhi got hurt was intentional but it is a play that needs to be dealt with more harshly going forward regardless of people trying to “read” intent. Was hoping it would be a series and it was a tough game to watch in that second half, especially for San Antonio fans. Looked like the Alamo – Vol. 2. Injuries on the Spurs’ roster have been the difference in this series to date. I can’t see the San Antonio pulling off the series victory without both Kawhi Leonard and Tony Parker. Spurs’ point guard Parker was missing in the first game of the conference semi finals and then Leonard goes down in injured midway through the third quarter which allowed Golden State back into the game. Antonio Cromartie and his fourteen children send their regards . Crazy story about the former Jets’ player fathering his sixth child with his wife (but his fourth with his wife , after a vasectomy which took place five years three years ago). One of the best cheesy 80’s movies out there. I live a few blocks away from Danielsan’s apartment complex, The South Seas and drive by it all the time…..Regret to inform that the empty field that Mr. Miyagi saved him from the skeleton crew is no longer. Track homes are currently being framed up on that sacred ground and will be finished within a couple months I would suppose. Watched Celts win game 7 w yr uncle A! Was fun! Wonder what the line will be vs LeBron?! That sequence of events in the third quarter, Curry getting hot, Kawhi turning his ankle, GSW going on that 18-0 run, was beyond surreal. I’m not entirely convinced Golden State wouldn’t have won that game even with a healthy Kawhi! They’re that dangerous. With Kawhi out, San Antonio has no other offensive options. Aldridge had proven utterly useless and come on, Pau Gasol is an old 36.
Who on this San Antonio team is going to get buckets consistently? Meanwhile, GSW is scoring at will. The line in Game Three is Golden State minus 6.5 and Vegas is assuming Kawhi is going to play. We NBA fans have waited long enough. Let’s get to this Cleveland-Golden State series already. I can’t wait to see what the ratings are going to be like. Like you and every other San Antonio fan, I really would like to have seen what a healthy San Antonio team could have done against Golden State. A video of you throwing a Huffy into the apartment dumpster would be priceless. Since you asked, the Celtics are more than 5:1 underdogs to win that series.